To make changes to the way your profile looks, you can access the Settings page (geared cog Icon) in the sidebar on the left of your screen or access your user avatar (upper right corner of the screen) and then click on the Profile button. You may change what is visible by clicking on the Edit My Profile button. To change the text that appears below your name, click the Headline option and change as you please. 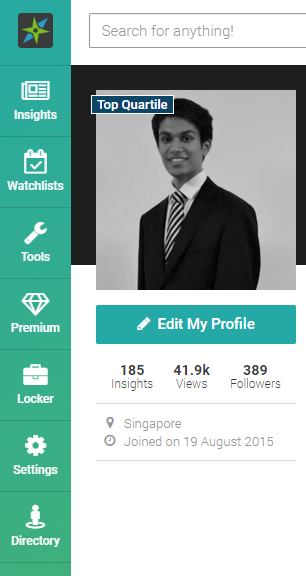 Please adequately populate the Summary/Bio section as well as the Work Experience and Education sections. Clients and other Insight Providers always want to know what you did prior to joining Smartkarma. The settings of an Insight Provider Company can be changed by the Company’s Compliance Officer. To see how to do this, click here. If you are publishing under your company name but do not have a Compliance Officer, please contact the Smartkarma team at content[at]smartkarma.com.